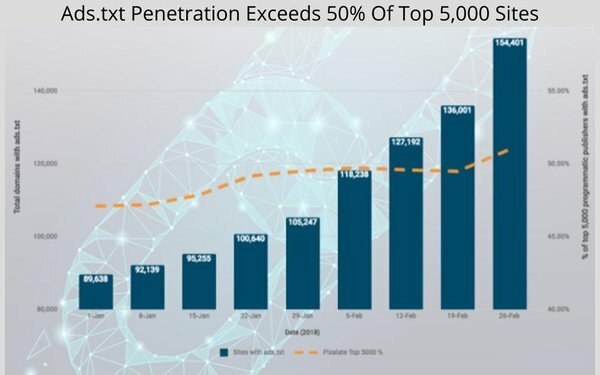 Ads.txt has reached another critical mass milestone, penetrating more than 50% of the top 5,000 programmatic sites, according to the latest analysis released by Pixalate. In total, that represents more than 150,000 publishers, but more significantly, it represents to creme de la creme of digital publishing used by big brands and major programmatic media buyers. The speed of adoption does not appear to be decelerating -- in the first two months of 2018, 65,000 new publishers adopted ads.txt, expanding the marketplace by 72% -- that it might be time to shift the focus from sites that have adopted the IAB-led anti-fraud standard to those that have not.